Yesterday, when we were in Montisi, we stopped by our friend, Daniela's, B& B. If you have been to my Montisi villa workshop, you will remember Daniela. She was Alessandro, our Tuscan chef's, assistant. She is a charming enthusiastic Italian woman, who can do everything. I think running a B & B is the perfect job for her because she has a bubbly, welcoming personality and is very creative and artistic, plus she is the fastest dishwasher I have ever seen. Santa Caterina is the B& B she has just began running. When we stopped by yesterday the B & B was filled with English guests who had come to attend the wedding of Ann's daughter. Ann is from Manchester and is another wonderful woman who runs tours and lives in the village. Its a very friendly village. I wanted to see the B&B because it is where Alessandro and I will hold our cooking and painting classes for 2 weeks in October 2015 during olive harvest season. Alessandro will teach cooking techniques you can use in your suburban home kitchen if you don't happen to own a palazzo or a villa. We found that the B&B has a great big long dinning room table where we can sit and paint while some of the members of our group are learning to cook. Then we all get to eat the results of the cooking lesson. Alessandro says he can teach 6-8 students so if this workshop is something you might want to do, let me know soon. 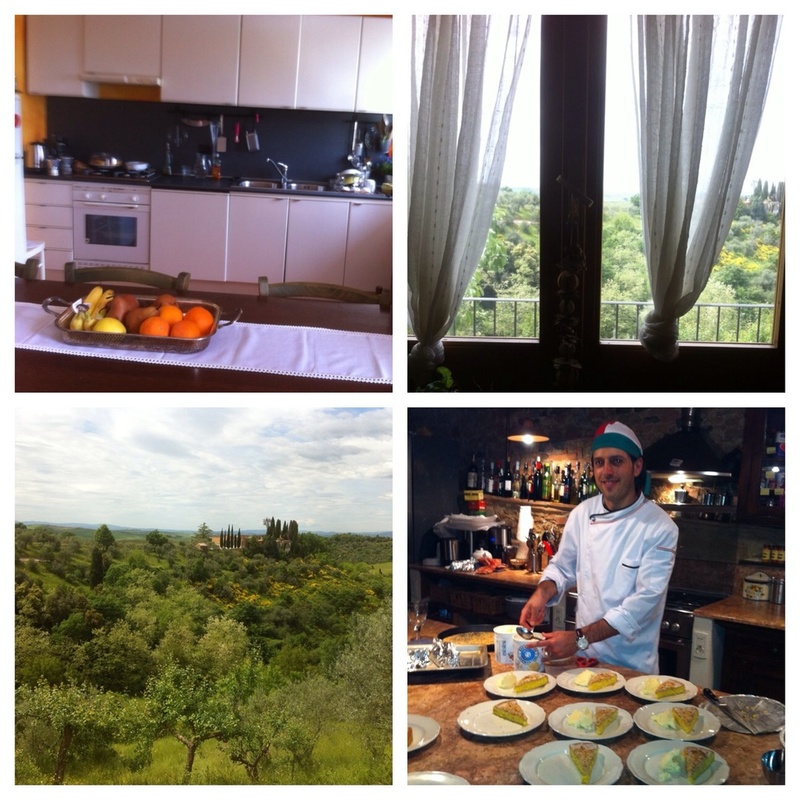 From top left: the kitchen, the views and Alessandro, the Tuscan chef.